JDK, Ant and Maven need to be configured. You can find instructions in this section. 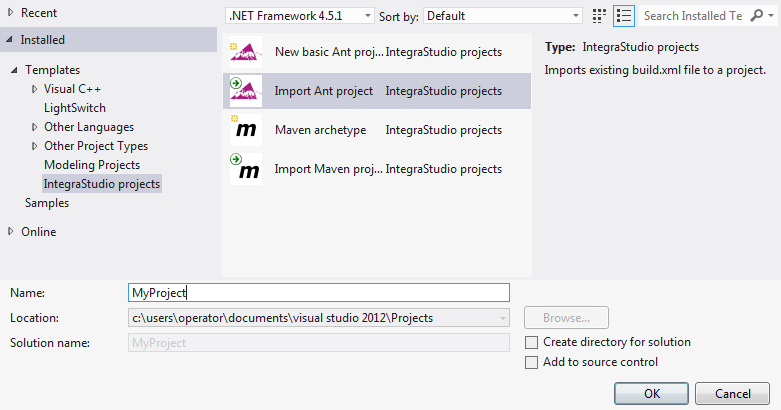 Choose File / New / Project... menu option in Visual Studio. The New project dialog will appear. Choose the Import Ant project template. Enter the name of the project. It will be set as the disk name of created solution (.sln) and project (.isproj) files. The name also will be visible as your project name in the solution. Other settings are irrelevant or set at later stage -- therefore they are grayed out. Do not use "Add to source control" for now (IntegraStudio Alpha or Beta does not support it yet). 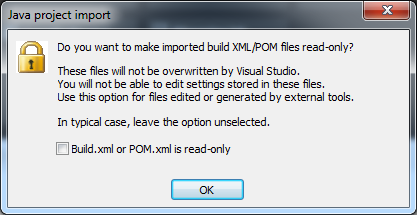 Click OK.
A new dialog will appear prompting you to specify thew location of build.xml file. This file can have other name, but needs to be an Ant XML build file. Choose appropriate file and click Open. Now you have an option to make imported file read-only. This might be useful if you also work with another IDE and your build XML file is automatically generated from other sources. You do not want to make any changes in it and intend to use IntegraStudio only for source code edition and debugging. In such case, enable this option. Otherwise (normal work with IntegraStudio on Java projects), leave the option unselected and just click OK.
Next, if everything goes OK, IntegraStudio will display a window informing you that the import has been successful. Click OK. Finally, Visual Studio will display its own standard dialog prompting you for the solution file name. You should be familiar with this, because it is the same as during creation of any other type of project (e.g. C++ or C#). Most likely you want to keep default solution name. Click OK. The project is now ready for work.